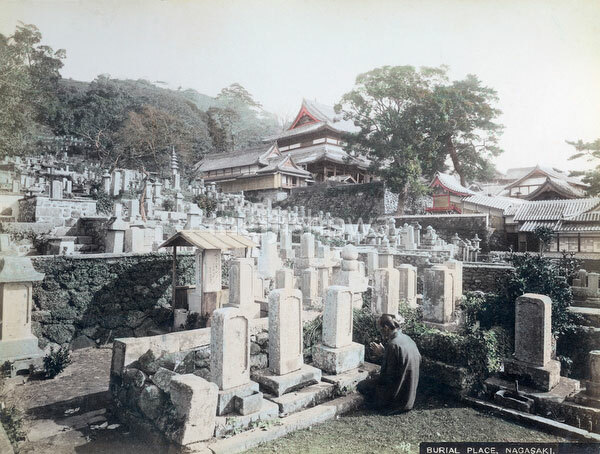 A man prays in front of a grave at the cemetery of Honrenji Temple in Chikugo-machi, Nagasaki. The multi-storied building in the center is the main building. It is constructed in the irimoya style. The Ihaido is visible to the left. Honrenji temple was constructed on the location of the San Lazaro Hospital and San Joan Baptista Church. After the Christian facilities were destroyed, a temple of the Nichiren Sect was established here by the monk Nichiei of Omura Hongyoji in 1620 (Genna 6). Honrenji was destroyed by the atomic bomb in 1945 (Showa 20), but has been gradually rebuilt.